When I meditated on this card, it actually took me some time to see that Joanna Powell-Colbert, the creator of this deck, had not just reinterpreted the Wheel of Fortune but totally replaced it with a different wheel – the Wheel of the Year. That leads to a very different potential set of meanings. The biggest contrast is that unlike the traditional Wheel of Fortune, the Wheel of the Year is utterly dependable. Weather will change, even climate may change, but the sun will rise in the east and set in the west, and days in summer will be longer than the nights. When the situation reverses in the winter, on the whole, the weather will be colder than it was in the summer. I know these things down in my bones, and so does the planet. Here, people (cats) from different stations of life are situated around the Wheel, with a blindfolded figure (referencing Justice?) at the center. One implication is that the wheel turns, of course, and people may rise and fall. But that is too simplistic an approach in context: random events are not going to turn a pauper into a prince, especially not in Medieval Europe, and while we all long to see karma paid back, except to ourselves, it seldom arrives in neat packages of retribution or beneficence. 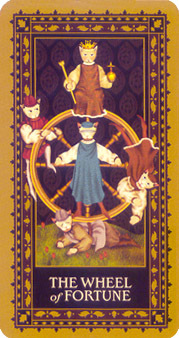 In particular, during the historical period symbolized on this card, the Wheel of Fortune, with its promise of changing life circumstances, was even more of an unattainable dream than it is now for most people. So what happens when we replace one utterly unreliable Wheel with a different one, a Wheel turned by gravity and as dependable, at its core, as the fabric of space and time? 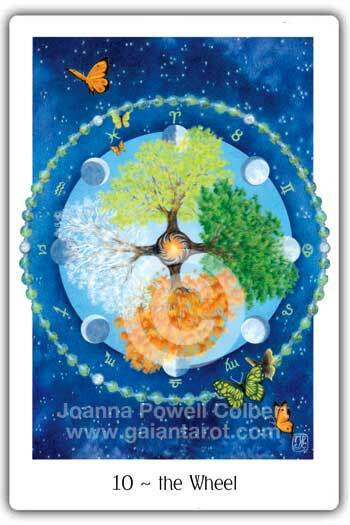 Personally, I have an entirely different reaction to the Wheel in the Gaian Tarot. The reminder of the seasons is a welcome one, even if the changing seasons sometimes bring devastating storms, as the East Coast of the US recently learned again. To me, the Wheel of the Year in this card reminds me both that change is inevitable – and brings the unpredictable – but that it’s also, in some ways, dependable, and that the changes themselves, like the seasons, are impermanent. I have to say that I personally don’t like the quasi-Buddhist “escape from the wheel” interpretation, because I find it is disturbingly easy for that idea of “escape” to turn into disregard for the “earthly” and preference for the “spiritual.” To me, Paganism involves valuing the “earthly,” and certainly not trying to escape from it. That the creator included that in the card while putting so much beauty into portraying the Wheel of the Year speaks to me of what might be a deep cognitive dissonance within some Buddhist-influenced approaches to Paganism…but that’s another topic. For now, what do you think of replacing the Wheel of Fortune with the Wheel of the Year? How do you read, or ride, the Wheel? This entry was posted in divination, nature, Pagan, Tarot and tagged divination, nature, Pagan, Tarot, Wheel of the Year. Bookmark the permalink. 6 Responses to The Wheel of Fortune or the Wheel of the Year? I do understand – the Wheel of the Year isn’t universal by any means. I think the card does a better job of expressing the “cycle of nature” idea, and it’s my Wiccan bent that’s reading that as the Wheel of the Year. So make of it what you will! The blindfolded figure isn’t Justice, it’s Fortuna, the personification/goddess (depending on who’s doing the talking – the mediaevals were for the former, the Romans for the latter) of fortune and luck. She’s the one Orff’s famous(ly overused) ‘O Fortuna’ is addressed to. She’s blindfolded for the same reason as Justice, though – in the long run, she favours nobody and those who rose once fall again. Actually, in this deck, it’s also echoing Justice, who is dressed almost identically, so it’s not just the blindfold. That’s pretty neat: replacing the Wheel of Fortune with that of the Year (well according to your Wiccan leanings which I don’t really mind). I think it still meets the ‘requirements’ (that of destiny, wyrd, fortune, etc.) of the Wheel of Fortune but in a totally different light. While both wheels depict not only the *fall* but also the *rise* (and so on, etc.) the Wheel of the Year seems to have lost that aura of malediction that I think surrounds the card in older decks. I think one should also note that the seasons come and go without any regard for us (we don’t control them) and sometimes we find ourselves enjoying them while at other times we find ourselves struggling through them (e.g. having one’s heating system die on a dashingly cold winter night!). As for the symbol itself I don’t think the Wheel depicted necessarily has to imply the four Fire Festivals and four Solar festivals; instead, it can imply one’s own particular holidays and festivals. My two cents. Blessings. I’m glad I’m not the only one who sees this as less malicious or capricious, although I also know the seasons don’t take our tender sensibilities into account. You’re absolutely right about it not being tied to the eight Sabbats version of the Wheel of the Year – the allusions to the zodiac and the seasons are much more widely applicable. Yay Pagan variety!